For anyone who is curious, here is what the results from a GDC talk look like (scroll down if you want to skip my intro and commentary). One of the things I like about GDC is they track who attends, and automatically email people response forms. As a speaker this is great, I want to understand how people felt about the talk, and hear the negatives. The basic scores and response rate help measure engagement and how well or poorly you did. From my perspective good is only "ok" you really want to hit as many excellents as possible. The major negative themes seem to be that there wasn't enough content for experienced narrative designers - that's fair. The theme of the talk was more about applying existing techniques to multiplayer but I could have pushed for some more advanced content. Great content. Great delivery. Today I learned. Great analysis & examples, and immediately relevant to my work! Highlight of my GDC so far! Clearly organized with great examples, smooth pacing, and inspiring directions to take back home. A good set of rules and techniques for establishing narrative in multiplayer games. But it really wasn't established why these stories are important in multiplayer games in the first place. Especially when the narrative touch is implicitly made lightly in the first place. It only convinces me, as a player, that the story is irrelevant. Consummate professional. Excellent slide design. Amazing , informative session, definitely the best one I attended. Fantastic. This was a strong narrative talk - great examples backed with real results data. Really loved hearing the panel discussion. The speaker was knowledgable about the topic and had some interesting things to say. Very confident and informative speaker. Christina provided a wealth of tangible, actionable content in this talk, which she delivered with passion and confidence. Easily the most informative talk I saw this year. Fun examples and solid takeaways. Would also have liked to see failures but understand time constraints. A delightful and succinct set of guiding principals for non-obstructive narrative, relevant not just for competitive multiplayer, but for all games. People in general don't put much emphasis on League's lore, so I wasn't expecting to learn much from this, but it ended up being a really good presentation. Very interesting and useful concepts. Best talk so far. Clear breakdown of benefits, pitfalls and techniques, even for someone who has never played LOL. It would have been great to discuss some other experimental ideas, but all in all it was really enjoyable and useful. THIS TALK WAS AMAZING!!! It was super useful to hear how riot implements narrative and their rules of never making story interfere with the gameplay. Very good session, clear slides, very good outline of the topic, and how to overcome problems with multiplayer narrative. Very interesting, and her post-session wrap-up was extremely insightful and welcoming. This talk has no takeaway and ended up being a massive waste of time. Great stage presence with many examples given on the topic. Love hearing about what worked and what didn't. Nothing new for players of League, but assumed it would be useful for non-players. Information was mostly obvious and should've contained newer games (Titanfall) and possibly some areas of exploration for the future. A great talk on narrative from a real expert in the field. Very good topics, but did not provide good solutions. Christina had a wonderful presentation and slide show. She had great examples, was clear, and ended on time. I would love to attend another one of her informational sessions. Very good conversation about making people care and resonate with characters in a very open-narrative structure. Good session, a few points seemed a bit obvious but that might be because of my experience. Excellent talk, well structured and presented. Before this lecture I didn't believe in storytelling in repetitive multiplayer games. Excellent speaker, interesting subject material. Norman is a great speaker. I enjoyed the practical examples, as well as the acknowledgement that there are other techniques she didn't go into. Most designers think that "there's no story in PvP" and I think it's great to have a voice expressing a different view. Speaker was well prepared with engaging material throughout the hour. Very accessible and informative lecture for all branches of game development. Speaker handled questions very well. Thanks for checking out my GDC talk "Competitive Storytelling". A presentation is more than just slides, it's also the accompanying presentation. Please keep that in mind as you read! If you have any questions or want context, hit me up on twitter @truffle. Or, how to jump from college student to home chef in 10 minutes (kind of). I wrote this up for a friend to summarize some cooking tips, thought I would share it more widely! This is for anyone who has an interest in developing home cooking skills. The focus is on simple and cost effective techniques. These also make great gifts to ask family for at the holidays. Also girls dig guys who can cook. You don’t need all these things, they progressively will improve your ability to cook effectively at home. You can buy them one piece at a time. Amazon links provide examples, but research on your own what’s best in each category! Refined Coconut Oil: Or other oil with a high smoke point. So you can sear meat at a high temperature. Cast Iron Skillet ($32): Must be hand washed, rusts if you put it in the dishwasher. Provides the best sear on meat. Is very non-stick when used properly. Basic Knife Block Set ($32): Ensures you have the right tool for any cutting task. Chef’s knife ($37): Use this to cut most things, use the knife block set for everything else. Take good care of it. If you want high end try this one. Crock Pot ($50): Make large quantities of tasty food simply and cheaply. Most recipies are - throw a bunch of ingredients in crock pot, leave alone for 6 hours. Pressure cooker ($55): Optional, but you can do a lot of cool stuff with a pressure cooker. Sous Vide ($404) + Food Saver($80): Ok this one is expensive and not for everyone, but with this you can elevate yourself from home cook to home chef. Long term this can save you money (see the Sous Vide section). Don’t buy the “combo” version that includes a vacuum sealer as the food saver brand one is much more reliable. Modernist Quisine at Home ($86): If you buy a Sous Vide this will teach you how to use it and make restaurant quality dishes. You can do the same with the Internet, but this is a great guide and is highly recommended. I am going to keep this super short. Season your meat. Salt and pepper is fine, or you can buy a different seasoning mix. Amazing how many people don’t do this! Use oil in the pan. If you are concerned about calories, eat less meat. Sear the meat. Meat with a good sear is much tastier than meat that is limply cooked. How to sear. Heat your pan to a hot temperature with the oil in it. If the oil starts to smoke, buy better oil. Drop the meat in and sear it. Don’t move it around for a couple minutes. Flip or stir gently to achieve an even sear. If lots juice is coming out of the meat, you are stirring it too much. If it takes more than 2 minutes to sear, your temperature is too low. If the meat seems burnt, your temperature is too high, or you cooked it for too long. Once the meat is seared you will want to cook it on a lower heat (assuming you didn’t use a sous vide). Your cast iron pan is great for searing, but takes too long to cool down, so use another pan if you have to cook it more. The other pan should be pre-heated. So irritating, why not get a Sous Vide? 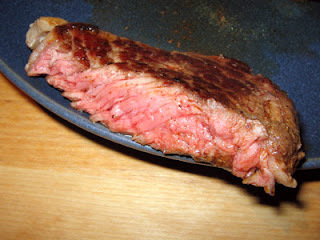 Your meat will be better cooked than any restaurant unless they use a sous vide in which case it will be equally cooked. You can leave meat in a Sous Vide for hours and it won’t become overcooked. You can go from Sous Vide to table any time in five minutes. This means you can focus on cooking the rest of your meal, the meat is easy. Seal your meat in a food saver bag. Remember to season. You don’t need to marinade but you can if you want. Leave it in the sous vide for hours if you want, it’s fine. How you can save money by cooking with a Sous Vide. You can buy less expensive cuts of meat and they will taste better than expensive meat. Do this enough times, you'll save money. Try chuck roast, brisket, top sirloin. Dishonored is game two of the seven games in seven days I played over the Christmas 2012 holidays. I played Dishonored and Deus Ex back to back. My main concern with Deus Ex was execution in gameplay. Luckily, Dishonored knocked this one out of the park. Balancing quality of game features versus scope of game features is one of the major challenges of game dev. Deus Ex favored the more features more options approach, while Dishonored kept scope tightly under control but executed at higher quality. Despite a smaller scope game options in Dishonored like completing games undetected, and without killing anyone, helped make the player feel like they had real choice in how they play. Smart game development in my opinion. The combat in Dishonored also feels really solid. The stealth feels a little old school and not super innovative – but it’s solid and that’s what’s really important. Graphics are very good. Story was compelling and surprised me. So dishonored is fun, polished, and you should play it. Of all the games I played over the break this is the one I’m most excited about returning to. I felt torn by Deus Ex. It has incredible artistic style. The cutscenes and writing are good, as are the thematics. I appreciate the fact that the game tries to let the player solve problems in a variety of ways. I know firsthand from working on the Mass Effect series how hard it is to give players meaningful choices in how they develop their characters that effect how they solve problems in the game. Despite all these positive aspects - the game has issues. Perhaps it’s because I worked on Mass Effect which is also a sci-fi RPG, with shooter combat, that I find it hard to overlook flaws in how Deus Ex is executed. The shooting feels clunky. The HUD is awkward particularly the in-game item highlighting. AI feels unpolished. These are all criticisms I would also direct at Mass Effect – which is why I worked so hard to fix those issue in ME2 & ME3. In the end I found these issues distracting enough that I chose to put down Deus Ex pretty early to focus on other games. I may return, but if I do I’ll probably turn combat down to easy, so I can rush through the combat and enjoy the story, level design, and progression mechanics which seem to be really well done. One last thing - I would have liked to see more early exploration of the protagonist's feelings about being cybernetically augmented against his will. Perhaps this happens later in the story, but he seems to take it too easily. I wanted to use some of Christmas break to catch up on video games I didn't have time to play over the year. I set myself the following goal - play seven games in seven days. I figured it would be interesting to have my followers on twitter give input into which games I should play, so I did a quick survey. Here are the results. 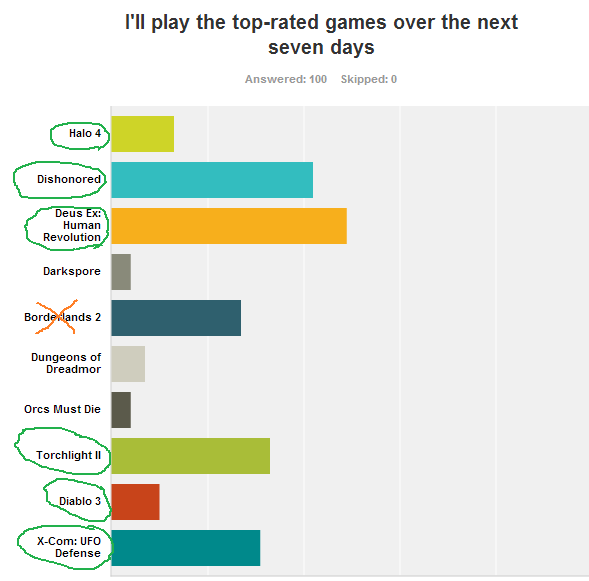 I played six of the top seven games. Unfortunately I had some technical problems with Borderlands 2, so I substituted in The Walking Dead which should have been on my list anyway! I didn’t complete all of these games, I played them long enough to get a feel for the overall design. This is pretty typical for game designers, we’d love to complete every game we play, but it’s more important to widely survey a bunch of games. Here are my quick thoughts from most voted to least. I'm a little behind on games, so I figured the holidays were a great opportunity to catch up on games I've missed, or games I'd like to spend more time with. Here's the list of games I'd like to play. I'm going to try and play 7 of the 10 games. I'll post an update with my thoughts after I play through the games!